A detonator is like a HitEffect delivery system that expands over time to the final range, rather than instantly notifying all Targets in range. This is excellent when simulating large explosions or traveling effects like a wave. Each Target is only notified once OnHit. 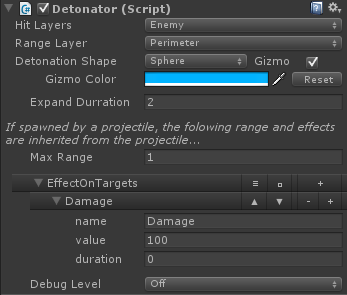 This can be instantiated directly or drag&dropped on to a Projectile to be triggered using the Projectile's range and EffectsOnTargets list. One or more Unity Layers used to reduce the number of objects processed. Only GameObjects in these layers will be found and checked for a Targetable component. The layer the range (perimeter) will be added to when it is created at run-time. The perimeter is created when the GameObject with this TargetTracker is instantiated. You are given this object because the perimeter uses a collider trigger and you may wish to add it to a layer that is ignored by other physics objects in your game. 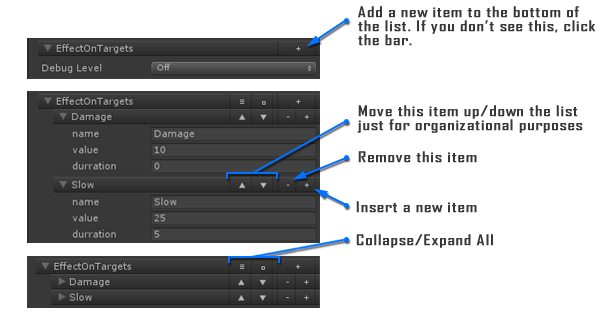 We recommend creating a layer in your game called "Perimeters". The shape of the area that will be used to detect Targets. This is how long, in seconds, it will take for the detonator to grow to the Max Range size. This is the final size the detonator will grow to. The available parameters will change depending on the detonation shape. Runs when this detonator is first triggered.